You can engage Rotary though your financial contribution to Rotary's extensive service efforts. THE ROTARY FOUNDATION is the engine that drives Rotary's global projects from providing education to children in the Pacific Islands, to clean water in Africa, to eradicating polio from the face of the globe. The Rotary Foundation also helps to fund projects at the club level. District 9930 clubs have received foundation grants to fund equipment at a vocational training school in Otorohanga, surf lifesaving rescue equipment in Papamoa, and historical markers in Maketu - to name only a few. The Rotary Foundation has received the highest rating given to charities for their responsible management of funds and low administration costs. Further, Rotary is able to add a major multiplier to all funds donated by using the volunteer resources of Rotary clubs around the world. 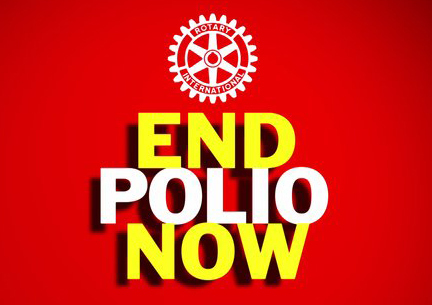 END POLIO NOW: The finish line of Rotary's 30-year quest eradicate polio from the face of the earth is in sight. 99% of the world is polio-free but until polio is complete gone no child, in no county, is safe from this dreaded disease. Polio can, and will strike again. Rotary is now working in the last 3 countries where polio is endemic, Nigeria, Afganistan, and Pakistan to wipe our polio once-and-for-all. Your financial support is needed now more than ever. To learn more about this amazing effort by Rotary, visit the End Polio Now website. You can donate now to End Polio Now. Alternatively, Rotarians can donate to the End Polio Now campaign through their local club. ROTARY NEW ZEALAND WORLD COMMUNITY SERVICE acts on behalf of all Rotarians in New Zealand to carry out a range of international development services. In addition RNSWCS also provides disaster relief to the Pacific Islands through its Emergency Response Kits. Visit the Rotary New Zealand World Community Service website for more information.